NAMA seems to think that there are millions of dollars to be recovered from the Dunnes from what NAMA claims was unlawful transfer of wealth from Sean to his wife Gayle, something hotly contest by the Dunnes. So if it were 100% certain that the courts would side with NAMA and that the funds were recoverable, then the trustee would almost definitely pursue the litigation. But of course no legal action is 100% certain, and, as the US courts have refused to grant NAMA orders freezing the Dunnes’ assets, there is no 100% certainty that assets could be recovered even if the trustee, acting for NAMA, were to pursue and win the action. So the bankruptcy trustee, Richard M Coan sought permission from the judge to engage his own law firm Coan, Lewendon, Gulliver & Miltenberger (pictured above) and the judge gave his approval today. Irish legal eagles might want to take note that the fees chargeable by US lawyers are USD 175 – USD 385 per hour (€135-295). It seems that these additional costs are deducted from the debtor’s assets before distribution to creditors. NAMA has also made sure that its US law firm McCarter and English is on record as its representative in the bankruptcy proceedings. 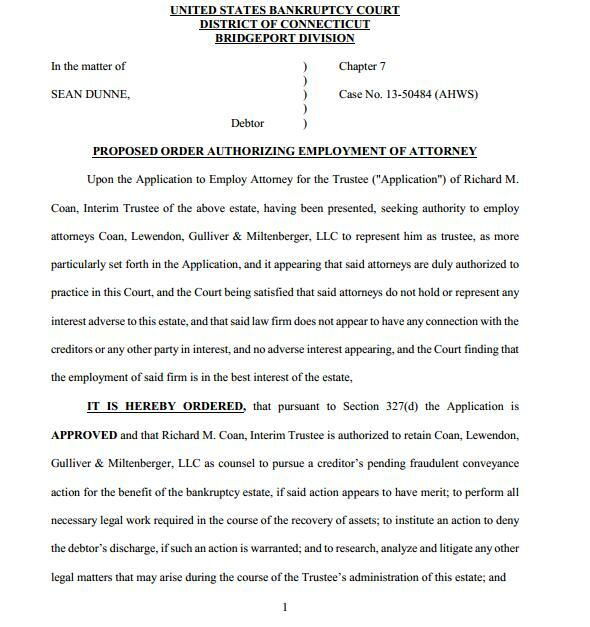 As we saw over the weekend, the judge has scheduled a hearing on 13th May 2013 to decide if Sean has complied with filing requirements and rectified his omission of documents in the initial filing. There is an audience eagerly awaiting Sean’s statement of financial affairs. It seems that NAMA has sold the €47m loan on the Ritz-Carlton hotel it was owed by Treasury Holdings company, Carrylane Limited, and if you believe Brian Carey in the Sunday Times yesterday, then it got “between €10m and €15m” or between 21-32c in the euro. The buyer is Sugarloaf Ventures Limited, an Irish-registered company which is backed by what the Sunday Times calls “Swiss investors Midwest and Brehon Capital”. Brehon Capital Partners appears to be an Irish concern, with an address at “5 Schoolhouse Lane, Dublin 2”, the same registered address as Sugarloaf Ventures Limited. Midwest Holding AG does indeed appear to be Swiss-based, and it is not the first time the two have teamed up for an Irish property venture, having previously bought the Marker Hotel in Dublin’s Grand Canal Square. US concern, Ranieri was previously in the running to buy the debt but seems to have fallen away. The suite owners are reportedly owed back rent. Worse, they believed they would be guaranteed minimum rental income for a fixed period. But alas, the new owner has renegotiated the rents with some suite owners and it seems the refuseniks will have the rent guarantees repudiated and be left to their own devices if they want to rent out their suites. Meanwhile, they face annual service charges of €15,136 and the Sunday Times reports that they will face “forfeiture of the suite lease” if they don’t cough up. Pat is on the record as saying this investment in the suite was considered sound at the time, and that in time, it may have been a retirement facility for him and his family. And indeed, back in 2006, Pat was certainly not alone in investing in property. There are a couple of legacy matters here though. There may be a mortgage or other loan on the suite to Pat and the suite has probably declined by 60% from its peak value – property generally has declined by 50% since 2007 and with the repudiation of the minimum rent, the decline in the Ritz Carlton suites is likely to be more. And secondly, there is the question of tax breaks. The regular audience on here will know that the €212m development of the Ritz Carlton involved the biggest single residential property tax break in the history of the State, so big in fact that the government had to apply to the European Commission for approval of state aid. That application was belatedly made by then foreign affairs minister, Micheal Martin and now, the EC has refused to hand over the paperwork in response to a information request from here, and the matter is before the EU Ombudsman as a complaint at present, who has given the EC until the end of May 2013 to comment on the complaint. The Sunday Times cites Sugarloaf claiming that the Revenue Commissioners may seek clawbacks of the taxbreaks from those suite owners whose suites are no longer considered part of the hotel. There are some 80 suites, and it seems that just under half – 37 – are no longer considered part of the hotel. It is not known if Pat’s suite is one of these. In the Dail recently, Minister for Finance Michael Noonan was asked how many clawbacks of tax have been pursued by the Revenue Commissioners. Minister Noonan said the Revenue don’t keep track because they regard clawbacks as additional rental income, but the response certainly gave the impression that the Revenue Commissioners do, contrary to popular belief, pursue clawbacks. So, it would seem that poor Pat faces reduced rental income on his suite and possibly the Revenue Commissioners will be knocking on his door seeking a tax clawback. And if that weren’t bad enough, his €630,000 a year contract at RTE comes up for renegotiation imminently, and the public is baying for blood in an RTE that made a total loss of €70m in 2011, and is understood to have suffered a deficit alone of €50m in 2012. This is the parliamentary question on tax clawbacks. Dessie Ellis. (Nominated by: Pearse Doherty) : To ask the Minister for Finance if he will set out by year for 2010, 2011 and 2012, the total of any tax allowance clawbacks sought and the total actually obtained by the Revenue Commissioners pursuant to Section 23 of Chapter 11 of Part 10 of the Taxes Consolidation Act, 1997. Minister for Finance, Michael Noonan: I assume the Deputy is referring to the clawback of tax relief associated with rented residential accommodation if the property ceases to qualify within the 10 year holding period. I am informed by the Revenue Commissioners that the relief is withdrawn by treating the relief already used as rent received in the period in which the property ceased to be a qualifying property. It is not possible to separately identify the amount of rent returned on the tax returns associated with this clawback and therefore the information requested by the Deputy cannot be provided. The recent Nationwide Building Society house price index for the UK showed that Northern Ireland was the best performing region in the entire UK for Q1,2013 when prices were reported to have risen an impressive 4.4% to an average of GBP 108,610 (€128,268). Mind you, according to finance minister, Sammy Wilson’s index based on all transactions for Q4,2012, Northern Irish residential prices are down 56% from peak in 2007, making their crash even crashier than ours and probably the worst property crash in the world particularly when the real decline after stripping out inflation is 63%. So, prices might be stabilizing in Northern Ireland after an horrendous crash and anecdote suggests that well-located family homes are in demand with competitive bidding and short shelf lives. 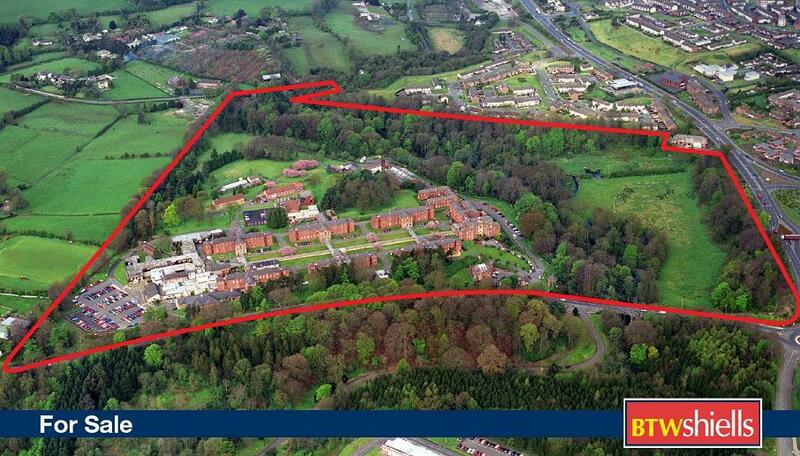 Today, a 62 acre development site owned by the Northern Ireland Department of Health, comes on the market in south Belfast. It is the site of the old Belvoir Park Hospital which closed in 2006. In its latter years it was known as a cancer specialist hospital but, when built in 1906, it was the “Purdysburn Fever Hospital”. It is off the Hospital Road and Ballylesson Road. There is outline planning permission for 310 homes, and so far, full planning permission for 110 homes. The property is being marketed by BTWShiells, and the brochure should be on their website later today. BTWShiells has acted in the sale of NAMA property previously eg the Cultra railway station in January 2013 and it has been doing brisk auction business. This is not a NAMA property and is being sold on behalf of the Belfast Health & Social Care Trust, which is ultimately under the auspices of the Northern Ireland Department of Health. The property will be sold by private treaty with no initial guide price and an online data room is being prepared.